The woman behind the counter at the Ollalie Lake store told us the forecast called for a heat wave over the next few days. It seems like the Pacific Northwest has no in-between. Before we left the store we removed our extra layers, put on sunscreen, and even dug the sunglasses out of our packs to use for the first time in days. We started to climb nearly immediately, but didn't mind as it was great to feel like we were back in the mountains after 40+ miles of forest walking through the emerald tunnel. We occasionally caught glimpses of Mt. Jefferson ahead of us, and had some views back to the north of Mt. Hood, but for the most part we were in the trees as we passed several pretty little lakes. We noticed many more casual backpackers as we entered this more popular and scenic region. As promised, the sky stayed clear and the sun got hot as the day progressed. We climbed steadily up an exposed slope through a burn zone near Pyramid Butte with long views to the north, enjoying the drama but feeling the heat. An island of intact trees provided a shady respite for a late morning snack. Happy Feet, who section-hiked OR northbound last year, told us that the 100-mile stretch from Ollalie Lake to Elk Lake is the most spectacular in the entire state so we were looking forward to the next few days of hiking. By mid-morning we began a gradual but sustained gain in elevation working steadily south towards Mt. Jefferson, whose glacier-capped jagged peak grew ever larger. We didn't see many hikers on the trail here, and enjoyed several alpine ecosystems during the climb. 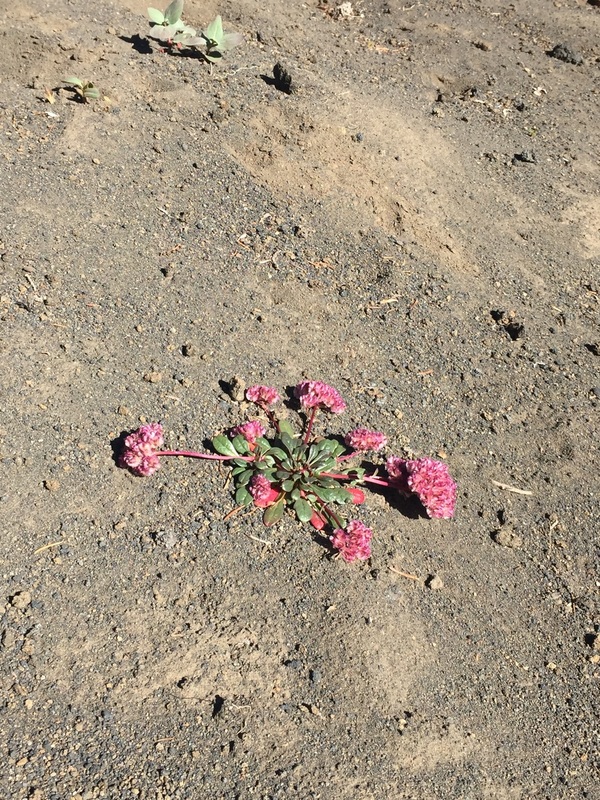 Early on we hiked through areas of mature dry forest, which gave way to dry but grassy and wildflower-filled meadows interspersed with areas of black volcanic sand and lava rocks supporting only stunted hemlock and sparse wildflowers. There were several dry tarns and streambeds, but no water. A bit higher up we came to an area with several large snowfields that had created pools of snowmelt surrounded by lush grasses and flowers, with taller trees on the leeward sides of larger rocks. Higher still the vegetation gave way entirely to huge piles of rocks, and the trail meandered around and through this rocky region following giant cairns and crossing a few snowfields in the process. So close to Mt. Jefferson, we again passed several weekend backpackers, including a pair of girls eating snowballs. It was a bit too dirty for me (though I was tempted), but I did harvest a handful to put under my hat on this hot August day. We climbed the final rocky switchbacks to enter the wilderness and find a panoramic view into the lake-filled basin of Jefferson Park, with Mt. Jeff standing tall just beyond. The ridge we were standing on was covered with dramatic windswept snags and krumholz, and curved around to the west in a steep golden sandy slope with patches of snow. In a word, breathtaking. 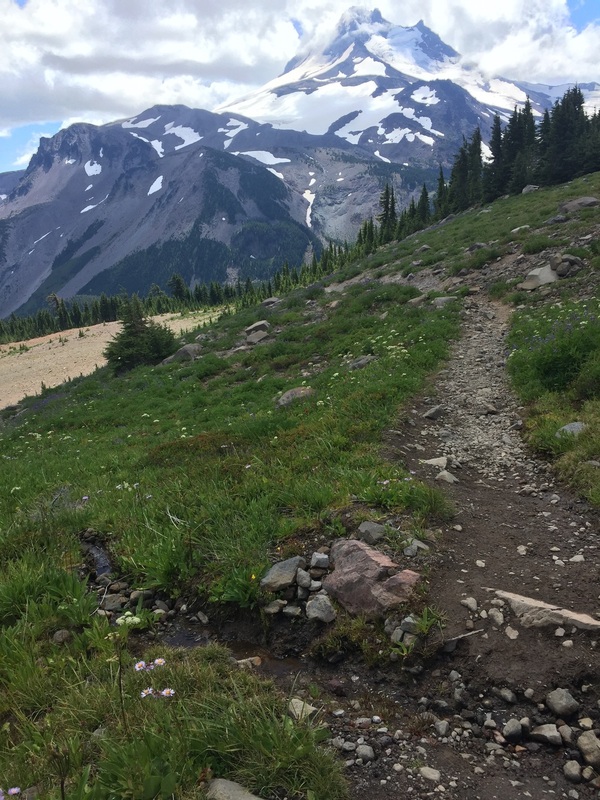 From our high point at just over 7000' we made a rapid initial descent into Jefferson Park and soon found ourselves surrounded with lush, moist meadows filled with every variety of wildflower and crossing numerous seeps and streams. What a contrast from the north side of the ridge! The trail meandered past several large lakes and continued to descend. We took advantage of the clear sky and warm sun, and stopped for early afternoon hummus & crackers at a large creek where we sat on a rock in the shade and dipped our feet. As we were adjusting our packs to go, we heard a familiar chatter and the trio of guys (Happy Feet, Long John, & Delta) came skipping down the trail. Somehow we had passed them during a break without any of us realizing it. We chatted briefly before they zoomed on by. The forest grew thicker as we descended, and after a while we found ourselves pushing through overgrown vegetation for long stretches. There was nothing as bad as in northern WA, and sometimes it was huckleberry plants with ripe fruit, but it was still an annoyance. We reached Russell Creek, the drainage from a glacier of the same name, to find a steep & narrow ravine of loose rock and sand surrounding the opaque and fast-moving silty glacial water. Below the crossing area was a large, intact snow bridge topped with several boulders that had dislodged from above. It was suddenly clear why the map listed Russell Creek as a "potentially dangerous ford." We saw the guys heading down the trail on the far shore, but didn't see where they had crossed. There was a trio of older guys far upstream on our side, though we couldn't tell if they had already crossed or were scouting for a location. Macro and I stood at the water where there were the most footprints, and agreed upon a series of rocks that should be doable for us both, assuming that they were not slippery. That is always a big assumption, and makes me a little nervous when crossing just above a snow bridge. But plenty of others had crossed before us, so I went for it & used my poles against adjacent rocks for balance. Happily, the rocks were solid with good gripping surface and it was a straightforward rock-hop. I scrambled up the sandy far slope with dry feet as Macro used the same rocks. We continued up the trail before the older guys made a move one way or another. Somewhere in the mid-afternoon, we looked at the time and our mileage and realized that our morning's goal of a 30-mile day wouldn't likely be achieved during daylight hours. We were nearing a limited entry zone with camping prohibitions, and could either camp ~5 miles earlier than intended, or push on to the next legal spot ~2.5 miles further along. Both options would be dry, but there was a lake mid-way between. We decided to stop for water and dinner at the lake, then press on to the more distant spot to dry-camp. Before starting our 4-mile climb to the lake we had to cross Milk Creek. Based on its name and our experiences around glaciated volcanoes of late, we assumed it would be another silty glacial melt stream deep in a ravine. As we broke out of the thick mixed forest into the early evening sunshine we found the water to be clear and shallow as it rushed over a smooth rocky bed in a deep but wide channel. The guys were there, enjoying the sunshine and the water and a meal. We exchanged plans and found that after yesterday's high mileage day they planned to camp at the site just short of Shale Lake, with water from Milk Creek. We told them we were continuing on but just then Macro found his water bladder empty, and our plan changed. Since he needed water anyway, we decided to stop and make dinner along the banks of the creek. We could get enough water for the next day and would then have flexibility to camp at whichever of the 2 spots looked more appealing. We waved to the guys as they started their climb. We ended up spending about an hour at the creek between filtering water and preparing/eating dinner. During this time we saw many hikers, mostly NOBO thru-hikers but a handful of others in both directions, stop to get water, dry gear, eat a meal, etc, before continuing on. It felt like we were at the watering hole on an African plain. Sometime after 6pm we started up the hill ourselves. The sun was low in the sky but the temperature was mild and we enjoyed the shade of our initially forested climb. The trail made gradual switchbacks up the slope before breaking out onto some rocky knolls with views of Mt. Jeff. We reached the small site where the guys were camped while the sun was still just above the horizon and while it was a decent spot with space for one more tent, it was unremarkable and in the forest and we decided to press on. We passed the bold warning signs and continued into the limited entry area to lovely Shale Lake, surrounded by shale and with a sweet view of Mt. Jeff in the early evening light. None of the designated campsites were occupied, but they require a special permit that we didn't have so we continued. We turned a corner and found ourselves on a high ridge in the throes of late golden hour light as we made the final ~1.5 mile traverse to our saddle. As the sun dropped below the horizon it cast a deep orange and then brilliant pink light on the pale rock around us that was simply magical. In the distance to the south we had our first views of 3-Fingered Jack, and far below us were the tree-ringed waters of Pamelia Lake. Once the sun set we hurried through the darker forested sections with just enough light to see, and reached the Hunt Creek trail junction as dusk was turning to dark. We were amazed to find a broad, heather-covered saddle with nearby stands of mature hemlocks and an unobstructed view of Mt. Jefferson. This would be the perfect spot to "cowboy camp" (sleep tentless) for our first night of the entire trip, and enjoy the night's meteor shower. As a bonus, there were nice flat spots for at least 5 tents but we found ourselves alone. We hurried to set up camp by headlamp and settled into our sleeping bags for some serious stargazing. This may be our favorite campsite of Oregon - if it isn't, I'd like to see the one that tops it. Day 37 dawned clear and cool at our high elevation saddle. A NOBO passed our campsite by headlamp while we were still having coffee/tea, before 6am. We weren't terribly efficient about packing up after a night of stargazing, and another 5 NOBOs passed before we hit the trail ourselves at 7am. We planned a long day to make up for the few miles we shorted ourselves the day before, and it seemed like it would be hot once the sun got going. The first mile or so there were several small but established campsites, and we assumed this is where the early hikers had stayed. We had great views of Cathedral Rocks (the other side of our ridge from last night), Mt. Jeff, and a flat high plateau aptly named the Table. From there we crossed back to the other side of the slope and walked through the edge of a burn area. We could see that this burn extended for miles across several distant valleys and slopes, and remarked on the extent of destruction. Like most burn areas on our hike so far, this one was actually quite beautiful in its contrasts between bleached and charred wood, verdant low growth, and sparks of bright wildflowers. We had better views of 3-Fingered Jack and first views of the more distant and snow-capped Sisters. As we passed our originally intended campsite for last night, there were two casual backpackers just packing up camp. We stopped to confirm peak identification with them and were a bit amused when they said "if you walk far enough south on the PCT, you'll go right over the shoulder of 3-Fingered Jack." We wondered if Mexico was far enough south. More burn zone hiking. Will it never end? The next 4 miles to Rockpile Lake were a pleasant meandering climb through sandy volcanic slopes of red & black lava rock, edges of the dusty burn area, and high plateaus reminiscent of the lunar surface. There were a few small dry meadows and patches of trees but for the most part we were in direct sun surrounded by dramatic but stark landscapes. When we reached the lake, a deep blue gem surrounded by trees on the edge of a small valley, it was hard not to stop. This would be the last on-trail water for ~12 miles and while we didn't need any to carry, we couldn't resist dipping our feet and rinsing our dusty legs. We found a NOBO thru-hiker and pair of section hikers there, and ended up chatting much longer than intended. On a sunny day, it was a bit of a trail vortex. Once we pulled ourselves away we realized we would have to hike steadily for the rest of the day to make our goal of camping south of Big Lake tonight. We had a little high ridgeline walking then dropped back into the large burn zone and there we stayed for most of the rest of the day. It was a dusty, hot, exposed, and continuous climb to the shoulder of 3-Fingered Jack. We loved watching the dramatic red and black spines of this iconic peak grow ever closer, but the actual hiking was a bit of a slog. Finally we crested the shoulder and I was elated to find a large snow patch, perfect for harvesting enough to stuff my sunhat completely full. We descended along the far side of Jack then dropped into an all-too-short section of intact but dry forest before returning to burn zone walking for the rest of the day. Fortunately, the cooling snow under my hat lasted a few hours and saved me from overheating in what had become a blast furnace of an afternoon. 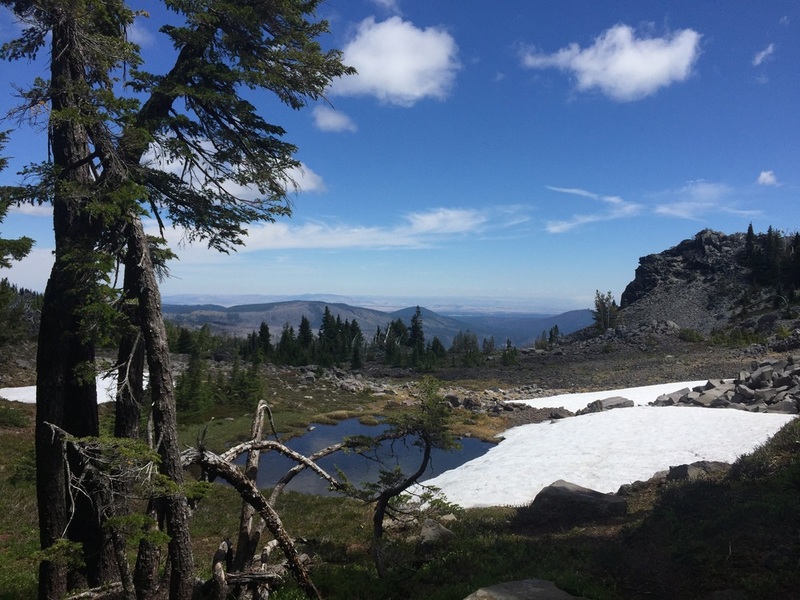 We crossed Hwy 20 at Santiam Pass and hiked the last few miles to Big Lake Youth Camp, a spot that welcomes hikers for resupply but more importantly had the only water access for miles around. We rolled in just after 6pm, and found a slew of NOBOs milling around all showered, laundered, and re-supplied up and ready to join the campers for a meal in the dining hall. We had planned to prepare our dinner there and fill up with water before hiking to the next campable spot for the night. We thought briefly about having the camp meal, but decided that our trail dinner would be more efficient and was likely to be more tasty than whatever they were serving to a bunch of summer camp kids. We were just wrapping up our meal of Bami Goreng (an Indonesian noodle dish) when the NOBOs returned, raving about the dining hall food. On the other hand, most hikers subsist on a diet heavy in Pop Tarts, peanut butter, and instant ramen (often eaten cold) so it wouldn't be hard to top that. I guess we'll never know if we truly missed out. In any case, we headed up the trail for a final 2.5 mile climb to the first flat spot to camp. Most of it was through more burned forest on a sandy slope but at least we had golden hour light and the moon above us. We reached our spot, found that we had it to ourselves (thankfully, as it was tiny), and set out a tarp to cowboy camp for the 2nd night in a row on a mild evening with more meteors. Fun Fact: We have found that an 8oz fuel canister lasts us ~6 days on average for this trip, and started our 7th canister on Day 37. In contrast, solo hiker Candy Cane was convinced by her boyfriend to start the trip with 3 canisters for the first 8-9 day stretch, as he was worried she would run out. We camped with her on Day 20 when she was still on her 1st canister, having sold one to another hiker in Stehekin and having cursed the weight of the other unused one for over 300 miles! (Her pot holds less than 1L and she cooks much less than us.) We cook every morning and have a multi-course meal every evening. Also, we use our canisters until they are empty then puncture and carry to the next spot for recycling. Many hikers leave partial canisters in the hiker box and start each stretch with a full one. It would be possible to hike the entire trail on free, partially-full canisters from popular resupply spots. But you would have to be OK with the risk of a cold meal now and again. It stayed warm all night and even the breeze was lacking a chill when we got up on Day 38. We had a short day, just under 10 miles to Highway 242 where we would meet our friend Heather's stepmom for an overnight in nearby Bend. 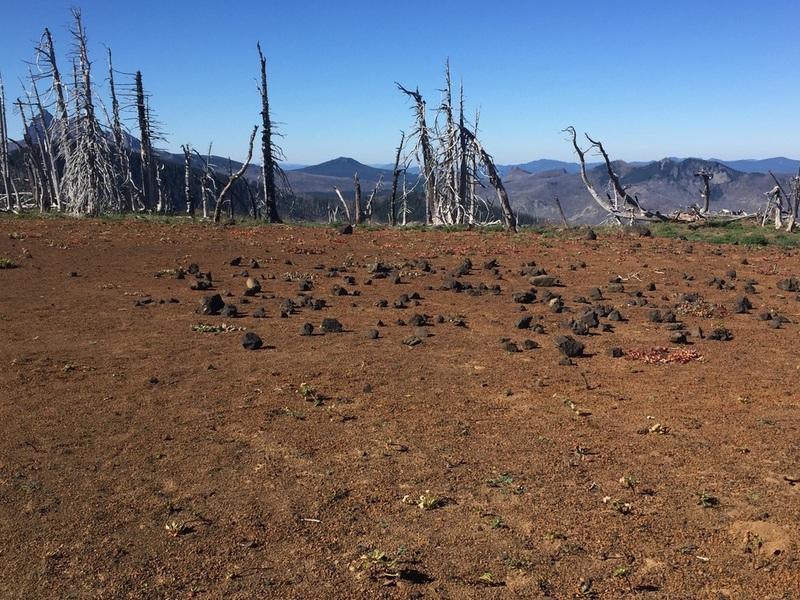 However, we expected to be walking through more burned forest and had also heard tales of how difficult it can be to walk across the lava beds. We wanted to get an early start to make the most of the morning's cooler temps and figured we could always amuse ourselves at the road if we arrived early. It seemed as though everybody had the same idea, since we passed a handful of NOBOs very early and a steady stream for the rest of the morning. After the first few miles of climbing we regained a view of Mt. Washington, and watched the sun come up from behind its dramatic pointy top. We were in burned forest, but found it beautiful without the blast furnace effect of the late afternoon. Likewise, when we reached the dark black lava fields that comprised our final ~5 miles of hiking we found them dramatic and beautiful, but no more difficult or annoying than any other rocky trail. It felt like walking across the moon in places, and we stopped frequently to take pictures of Mt. Washington, distant Mt. Jeff, the ever-closer snow-covered Sisters, and the snowless and rounded Belknap Crater with its dramatic creamy swirl. We reached the highway crossing in the late morning, a few hours earlier than our scheduled meeting time. We made it! Trying not to bake in the sun at Dee Wright. 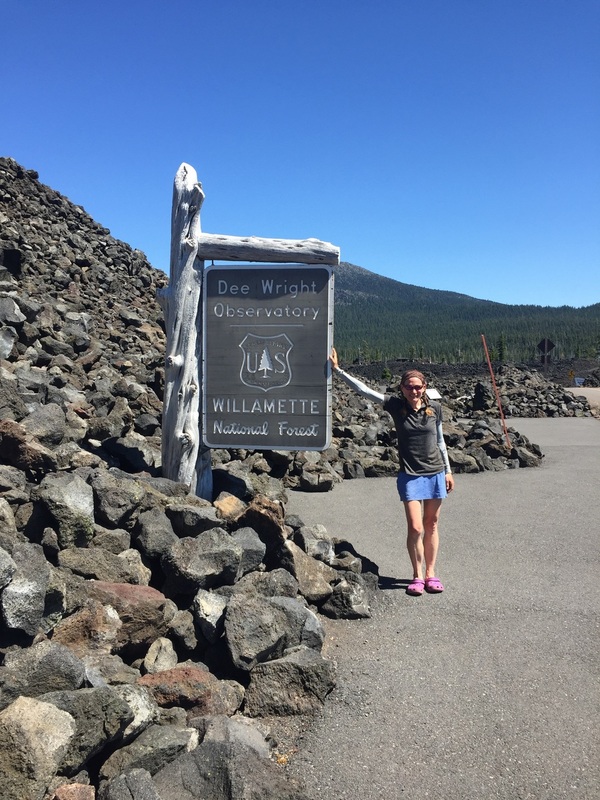 The Dee Wright observatory is a round structure built on a knoll at McKenzie Pass from black lava rock. Its small windows are each labeled with the name of the peak visible through the opening. We found it a perfect shady spot to finish our day's snacks, wrap up a blog post or two, and watch as a steady stream of tourists came in to spy on the peaks that we have either walked by in the past few days, or will be visiting soon. We are both ready for laundry, showers, and ice cream, but are looking forward to heading south into the Three Sisters Wilderness tomorrow for a little more volcanic drama.